We know the team behind Foursquare added the new NFC features for Android and Symbian devices so that they can easily check-in at places by simply tapping on NFC tags/stickers. Well now the same feature has been added for the app on the BlackBerry platform. 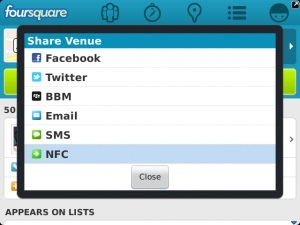 Foursquare has updated its app for BlackBerry smartphones today and has added the ability to check in to a location using the phone’s NFC features. So the new users of BlackBerry devices equipped with NFC can now easily check in at places.The app also features improved GPS performance, faster speed, and notifications in the main BlackBerry inbox. You can download the app from the BlackBerry App World over here.